At a specially-convened meeting of Skibbereen Theatre Society on Wednesday, 28 September, 2002, a vote of sympathy was passed, on their tragic loss, to the family of the late Paddy Keohane, Ballygurteen, who was always a great friend and source of encouragement to the group, and will be a huge loss also to Kilmeen Drama Group and the West Cork Drama Festival. 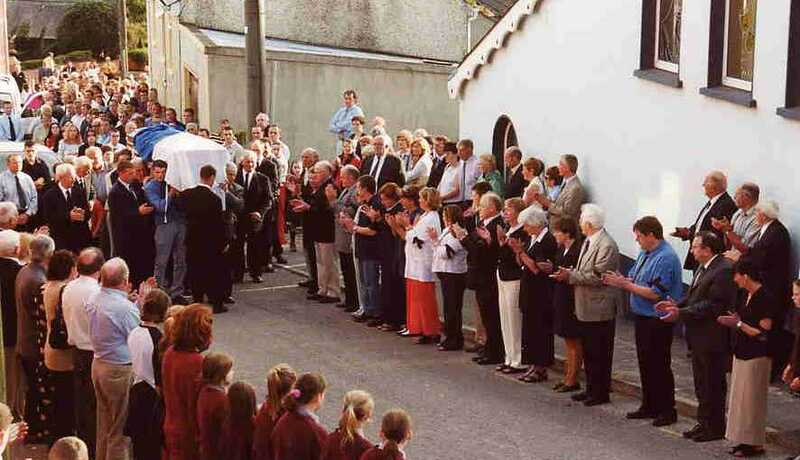 Picture (below) shows an emotional moment, as colleagues from Kilmeen and other drama groups, as well as West Cork Drama Festival personnel and representatives of various festivals from all over the country, give the late Paddy Keohane his final curtain call when his remains arrive outside St. Mary’s Theatre, Rossmore. Paddy Keohane gets his final curtain call as his remains arrive at St. Mary’s Theatre, Rossmore.